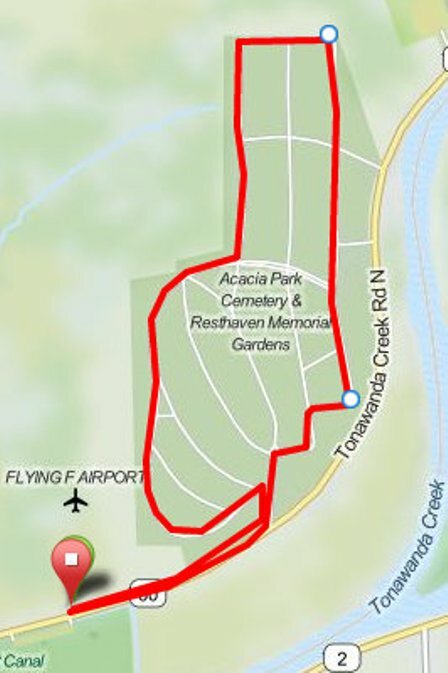 The first run/bike/run brick will be 6 pm April 30th 2015, and since Map my Ride does not go into the cemetery I will try to explain the route. However, there is a picture of the cemetery course at the end of this article. We will stage at the far eastern end of West Canal Park, at pavilion 5-L. On Google you will see a large parking lot and a smaller parking lot, we will be in the smaller one. There are bathrooms which are usually open and pavilion 5-L at the end where the staging area is. In order to have a mass start but not have everyone in the road, we will run a 1/2 mile around the pavilion, in the grass, then get on our bikes. That will spread us out a little to make it a little safer as we ride. You must walk your bike out of the parking lot, safely cross the street and face west towards Townline Rd. (The bike course is on the link above) Riding of course with traffic turn right onto Townline Rd., Crescent will merge with Townline so be cautious there, continue on Townline and turn right onto Killian Rd. Killian is the only Rd. where the shoulder is bad so you will most likely be riding inside the fog line, so be cautious here. You will climb a hill which signals the end of Killian. At the bottom of the hill turn right onto Bear Ridge Rd. Caution is needed here as the turn is sharp and can have loose gravel. Stay on Bear Ridge and stay right until you reach Tonawanda Creek Rd. DO NOT CROSS THE BRIDGE STAY RIGHT. Take Tonawanda Creek Rd. back to the park and the Pavilion, be cautious as you must cross the road back to the lot. The ride is approx. 6.2 mi. You will then run out the same way you returned on the bike, cautiously cross the street and run against traffic going east .3 to Acacia, turn into the cemetery, stay left, clockwise around the whole perimeter, approx. 1.7 mi., cautiously cross the road and run .3 against traffic back to the pavilion. We have decided to start May 1st and continue every other Thursday all summer. We will draw a name each week with who shows up and give out something to the winner’s, and you can only win once. We will not cancel any of them, show up if you can, and if you can’t, don’t. These are meant as training, work as hard or easy as you like, but safety is always the key. I did these a few years ago and once you know the course it work’s out well.